This entry was posted in Comments about Cycling on May 12, 2016 by Steve Tilford. Yesterday I drove to Dallas from Austin. It is truly amazing how much construction they are doing on I-35 between those two cities. They keep adding lanes, with no improvement of the traffic problems. I guess the people are arriving faster than the infrastructure still. Eventually people will cry uncle and not take part. Tucker is 5 months old today. The last week he has gotten pretty crazy. Like bird crazy, running crazy, anything crazy. He has gotten so much stronger in the last two weeks that he’s a handful when walking on a leash. He obviously needs to learn some manners. I’m thinking about racing the Thursday night training race at Fair Park tonight if it stays dry. I did that race once last year and it was super. I didn’t get to race last weekend, so it would be good. Then I’m driving back to Kansas and maybe doing the Flyover Series Races up in Nebraska this weekend. I have to decide that pretty quickly I’d think. I’d brought my MTB with me and was sort of thinking about racing in Warda at a Texas MTB series race, but forgot my MTB shoes. I would have seriously considered just staying here and racing, but for the sans shoes situation. It has been storming here in Texas like crazy the past few nights. Texas storms are like everything else here in, big. All the storms that plow through Oklahoma seem to start down here and go Northeast. They usually dump an enormous amount of rain. Riding in Wimberley, I got tosee firsthand how much storm damage is caused by these deluges. 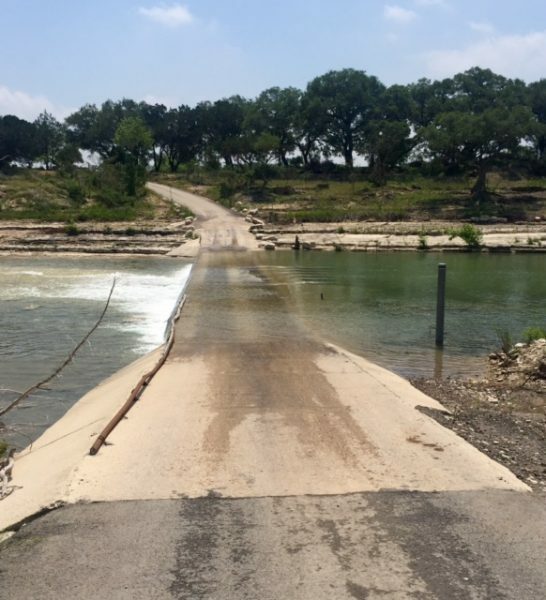 Wimberley was nearly completely swept away during a flood just last year. Okay, I’m going to go for a ride and then decide about racing. A low water bridge off of Flite Road, connecting to Fulton, outside of Wimberley, I had to ride over a couple days ago. 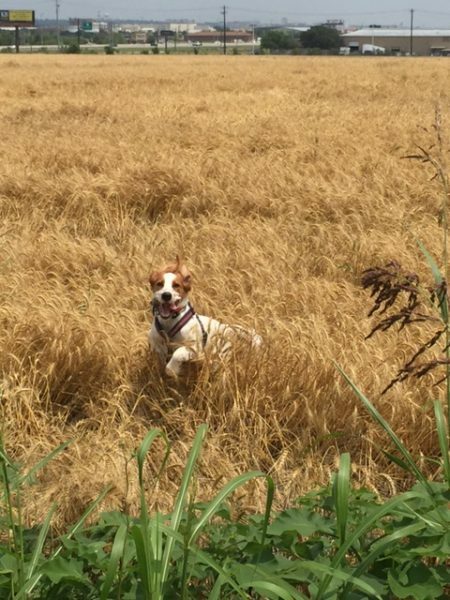 Tucker is a happy boy most of the time. Driving from Hell1 to Hell2? I think by 2020, 90% of the population in Texas will live in the triangle defined by Houston, San Antonio, and the Metroplex. They can have it. And just buy some cheap shoes, and race! Hate to break it to you Steve, but the Dallas Thursday Nighter was on Wednesday this week due to Fair Park concert. Robert Moses discovered this fundamental truth back in NYC during the 40s and 50s (after destroying dozens of neighborhoods)… The more highways (and lanes) you build supposedly to “alleviate” traffic, the more traffic you’ll get. You do know you can ride/race a mtb with road shoes and pedals, right? I was going to leave a similar comment. I think it’s called Induced Demand. Clip-I’ve done that before. Raced road shoes a few times. But, that being said, I don’t know the Warda bourse and have to assume there are technical sections that won’t be that great for the road setup. Plus, I’m a little rusty MTB riding and shouldn’t be adding to the issue. We called Tessie the Tesmanian devil at 6 months. At one year she is a sweetheart and a perfect trail dog. It was all we could do to keep from breaking her spirit. Glad we didn’t. Steve, just race warda. Your memory is fuzzy. There’s nothing technical there except the one carpeted cement drop and it’s not technical. You can get shoes from anywhere down there in austin. Someone will hook you up. What size are you? No thursday nighter this week. It was moved to wed as other stated. if you’re not running late or in a hurry you’re forgetting stuff.. anyway, let me know if you need a pair of shoes.. i have an extra pair of mt bike shoes. size 5 1/2 E.
As in “Richardson” Bike Mart? Cool! I love it. Lance’s name not even part of a local bike shop’s “history” tale. It’s like trying to find statues of Stalin in Moscow. Consider getting a “Gentle Leader” collar for Tucker. These are great for getting control of the high energy dog. I had a very energetic German Shorthair Pointer who could rip my arm out of the socket and I could control her holding the leash with one finger. When it comes to keeping control in situations where a leash is needed, I highly recommend it. Even big ‘ol Texas will fill up if the population is allowed to keep on expanding. Is that a bird in Tucker Tilford’s mouth ? Ha ha ! You can’t wear road shoes for one very unimportant mtb race? Steeeeve come on now. These little weekend getaways with Tucker( if that’s his real name ), are starting to look down right suspicious. Does the term ” zoophelia” mean anything 2 u? And why is Tucker always naked? Steve I’m going to ask u one time, and one time only. Have you ever found yourself staring at Truckers sphynkster? I mean longer than normal?………….BUSTED! I knew it! Thats beyond taboo. No wonder he’s bull-legged. Hell with the shoes I hope you didn’t forget your condoms.